Many Obamacare shoppers will have fewer insurers to choose from for 2018. Some 29% of current enrollees on the federal exchange will have the choice of only one carrier, up from 20% this year, according to data issued by the federal Department of Health and Human Services. Residents in eight states -- Alaska, Delaware, Iowa, Mississippi, Nebraska, Oklahoma, South Carolina and Wyoming -- will find only one insurer, up from five states this year. That's because many insurers, particularly large public companies such as Aetna (AET), Anthem (ANTM) and Humana (HUM), decided to exit or downsize their presence in Obamacare for 2018 amid all the uncertainty emanating from Washington D.C. Some 132 insurers will offer policies on the federal exchange next year, down from 167 this year and 237 in 2016. The federal exchange, healthcare.gov, handles enrollment for consumers in 39 states. The remaining states control their own marketplaces. Insurers are still offering multiple plans in every area, but that array is dwindling too. 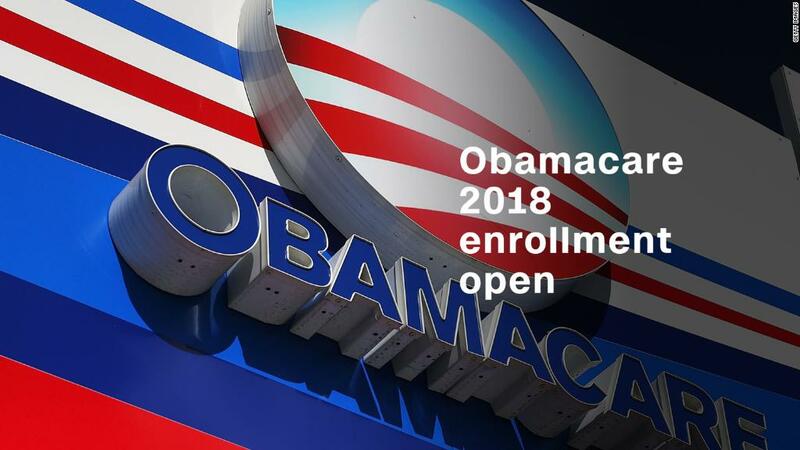 In 2018, enrollees on the federal exchange will have 25 plans to choose from, on average, down from 30 this year. The Trump administration and Congressional Republicans have repeatedly pointed to the decrease in insurer participation as a sign that the Affordable Care Act is failing. Still, the situation is brighter than it was a few months ago when it looked like tens of thousands of Americans in dozens of counties could have no insurer on their exchange at all. State regulators worked with carriers to alleviate their concerns and convince them to participate, according to a study published this week by researchers at Georgetown's Center on Health Insurance Reforms. For instance, regulators allowed insurers to raise rates based on the assumption that the funding for the Obamacare subsidies would end. Also, state officials worked with carriers to ensure their networks of doctors and hospitals were adequate enough to meet state standards. For instance, one regulator allowed an insurer to take the unusual step of naming a hospital in a bordering state as a primary site for care. But many consumers will feel the difference. They may find it harder -- or impossible -- to find a plan that covers their doctors or the prescription drugs they take. "When there's less competition, it's harder to get a health plan that meets your needs," said Chris Sloan, senior manager at Avalere Health, a consulting firm. Jane Dingledine, 62, is in this situation. The Coldwater, Ohio, resident could only select policies from Medical Mutual of Ohio, which agreed to cover her county for 2018 after Anthem said earlier this year that it would pull out. Dingledine will pay only $89 a month for a Medical Mutual bronze plan, rather than the $344 she was paying for her Anthem policy, thanks to more generous premium subsidies. But her deductible is $250 higher, her local doctors aren't in the network and the nearest hospital is nearly an hour drive away. She'll likely continue to see her doctors, but pay out of pocket, said her husband, Mike, who is on Medicare but helps set up his wife's coverage. That's what she did this year since they also didn't participate in Anthem, which was her only choice for 2017. "You're cornered," said Mike Dingledine, who has long been opposed to Obamacare. "This is your choice -- take it or leave it." The lack of competition is one reason why premiums are on the rise. Rates for the benchmark silver plan are jumping 37%, on average, for 2018, though most enrollees will be shielded from the increase by premium subsidies. The dearth of choices may contribute to fewer people signing up for Obamacare plans for 2018, Sloan said. This is especially if they have to switch insurers and don't like the providers and benefits offered by the new carrier or if they don't qualify for premium subsidies and have to pay much higher rates. The dwindling number of insurers is one of the biggest concerns about Obamacare's long-term health. The actions state regulators took this year to entice insurer participation may not work in the future. "There is strong consensus among state regulators and insurers in the [six states that were studied] that the solutions used to prevent bare counties in 2018, varied as they were, are temporary and unsustainable without long-term federal action," the researchers wrote.